Actually I would prefer oil, maybe in a pastoral setting, but if you are a prehistoric Kraken, its pretty good. We hypothesize that the shonisaurs were killed and carried to the site by an enormous Triassic cephalopod, a “kraken,” with estimated length of approximately 30 m, twice that of the modern Colossal Squid Mesonychoteuthis. In this scenario, shonisaurs were ambushed by a Triassic kraken, drowned, and dumped on a midden like that of a modern octopus. (maybe something like this) Where vertebrae in the assemblage are disarticulated, disks are arranged in curious linear patterns with almost geometric regularity. Close fitting due to spinal ligament contraction is disproved by the juxtaposition of different-sized vertebrae from different parts of the vertebral column. The proposed Triassic kraken, which could have been the most intelligent invertebrate ever, arranged the vertebral discs in biserial patterns, with individual pieces nesting in a fitted fashion as if they were part of a puzzle. 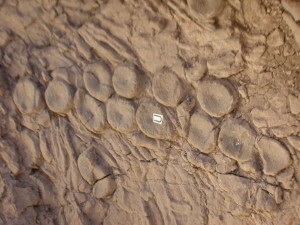 The arranged vertebrae resemble the pattern of sucker discs on a cephalopod tentacle, with each amphicoelous vertebra strongly resembling a coleoid sucker. Thus the tessellated vertebral disc pavement may represent the earliest known self?portrait. :shock:actually I heard once of a rare dino on Vancouver Island called the Stockersaurus. Let me know if you can run an article on that beaut.